5% Sibling Credit(Credit for each additional sibling enrolled after the first child). 10% Mini Day Credit for campers entering Nursery (3s program) ending daily at 1:00pm. What are your individual camp weeks? There are no refunds for absences, changes, withdrawal or terminations. Deposit is fully refundable through February 28th, 2019 (or 30 days after enrollment, whichever is later), less a $350 Administrative Fee. The $350 Administrative Fee is also fully refundable within 30 days of enrollment. All payments above deposit are fully refundable through May 31st, 2019. Can we reduce our weeks once we’re enrolled? Yes! NSDC Families can reduce their enrolled weeks up until the start of the first day of camp. You will receive a full refund for those weeks. Please note, it must be before the first day of camp. For example, a family who enrolls for 8 weeks in September, can reduce to 6 weeks at any time so long as it’s before June 27th (first day of camp) and receive a full refund for those weeks! Compensating the staff should be OUR job – Not yours! Tipping is uncomfortable for both parents and staff. Did you give enough? Did you give too much? Tips can add up to $350 or more to the cost of your child’s summer at camp. End of the summer tips do not positively affect the course of your child’s summer – while it is in progress! We set aside a $150 to $750 bonus for every counselor above their salaries – so essentially your tips are “on us”! We ask you to send us a confidential evaluation on our staff during the summer, which ensures that we have on-going feedback on how you think our staff is doing. What you say and what we see will be used to give regular in-camp evaluations & performance cash bonuses to our staff during the summer! There are no extra costs or hidden fees beyond payment for the session you choose! However, we do offer add-ons in the form of our popular “Camp Within A Camp” program for specialized sports & creative activities. Additionally we offer private swim and tennis lessons after camp. 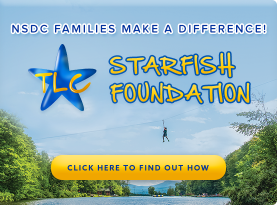 When you enroll your child at North Shore Day Camp, a portion of your tuition goes directly to the TLC STARFISH Foundation which provides underserved children with summer camp, educational, community and wellness opportunities. To learn more, click HERE.